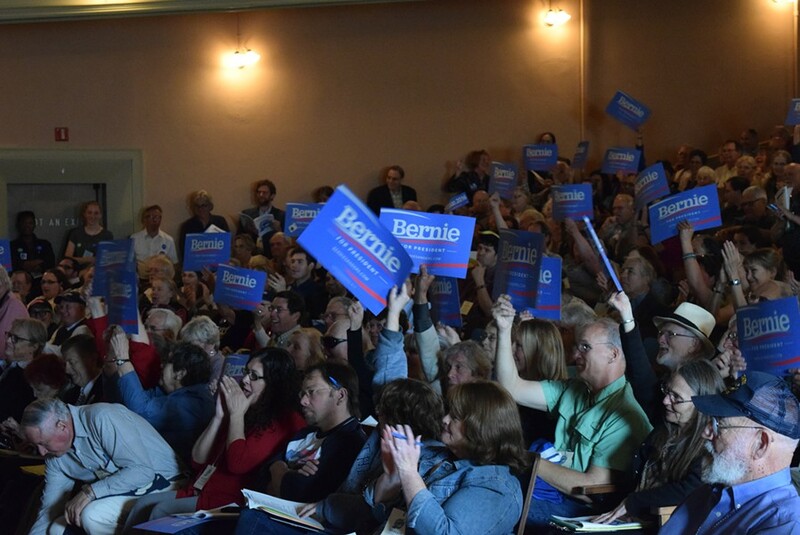 Vermont Democratic state convention delegates wave Bernie Sanders placards. 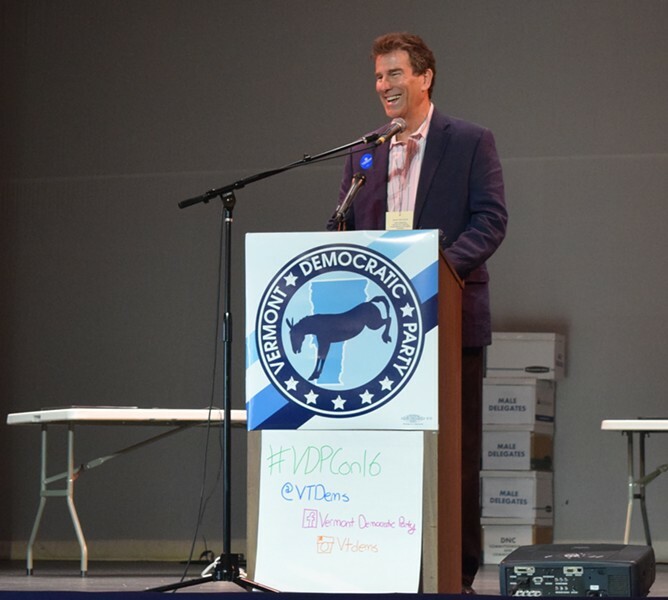 In one of the last actions at the daylong Democratic State Convention Sunday, delegates voted to endorse home-state Sen. Bernie Sanders (I-Vt.) for president. There was no debate and virtually no dissent. The vote captured the tone of the day: It was all about Sanders. “We love you, Bernie!” a state delegate shouted from the crowd as a videotaped message from Sanders — who was thousands of miles away campaigning in California — was wrapping up. 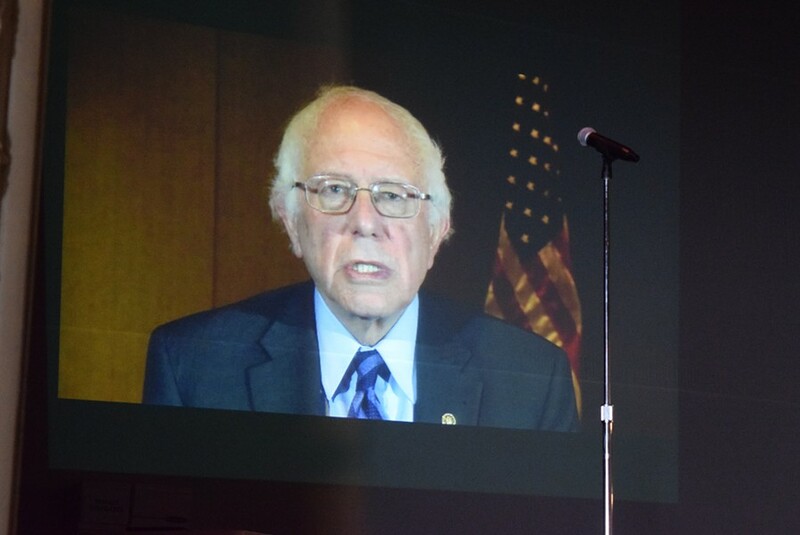 Sen. Bernie Sanders (I-Vt.) appears via video at Sunday's convention. 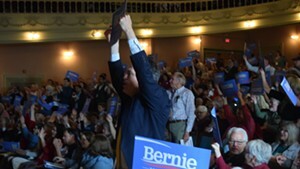 “As Vermonters, we will be the face of Bernie Sanders,” Vermont Democratic Party chair Dottie Deans told the crowd of 405 state delegates at the Barre Opera House. Sanders supporters were elected to represent Vermont at the national convention in July. Continuing the Sanders revolution was the talk of the day. “It’s really Bernie who got me involved in this,” said Maria Rinaldi, 37, of Jericho, who attended her first state convention and won one of 11 coveted delegate seats at the national convention. This is a political party that the independent Sanders has never embraced, but at least for Sunday he seemed to own it. Speakers studiously avoided almost any mention of Hillary Clinton, Sanders’ rival for the Democratic presidential nomination, even though Clinton is the odds-on favorite in the race. There was no acknowledgement that Sanders’ delegates could face bitter disappointment at the national convention. Still, the event featured none of the tension that plagued last week’s Democratic convention in Nevada. There, Sanders supporters accused the party of rigging the rules in favor of Clinton. That event devolved into near chaos that has party leaders nervous still. Deans conceded she had worried about whether such voter discontent would play out at the Vermont convention. “You hope for civility, you plan for not,” she said. Civility prevailed because it was all about Bernie. Based on Vermont’s March 1 primary results, all 11 district delegates selected Sunday will be pledged to support Sanders through at least the first round of voting at the national convention. That made it easy for more than 100 delegate candidates to focus exclusively on the Vermont senator. And unlike the situation in Nevada, those in charge of the Vermont convention could hardly be accused of working for the enemy. Rich Cassidy, the convention chair, is a superdelegate who supports Sanders. So are Deans, the party chair, and Tim Jerman, the vice chair. Democratic state delegates cast their ballots for delegates to the national convention. While Bernie placards were prevalent, there was not a Clinton sign in sight. Much of that support came from eager first-time convention-goers. 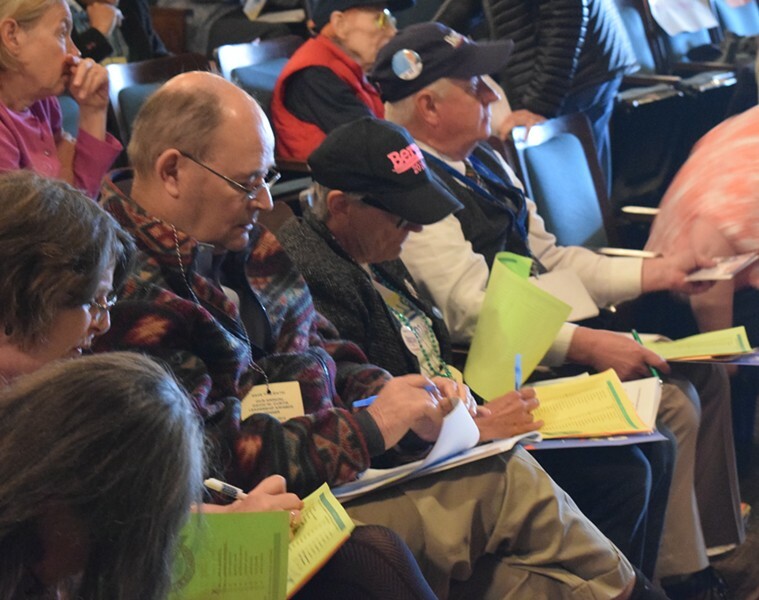 One of them, Claudia Pringles of Montpelier, won a district delegate seat and narrowly lost out to state Rep. Mary Sullivan (D-Burlington) in a contest to become the new state committeewoman. Pringles won over the crowd promising to change the way party politics are run. “Sometimes you need to be the mosquito in the room, rather than the elephant,” she said. Pringles said she came to Barre afraid everyone else would know each other. “But it seems like a lot of people came here because of Bernie,” she said. 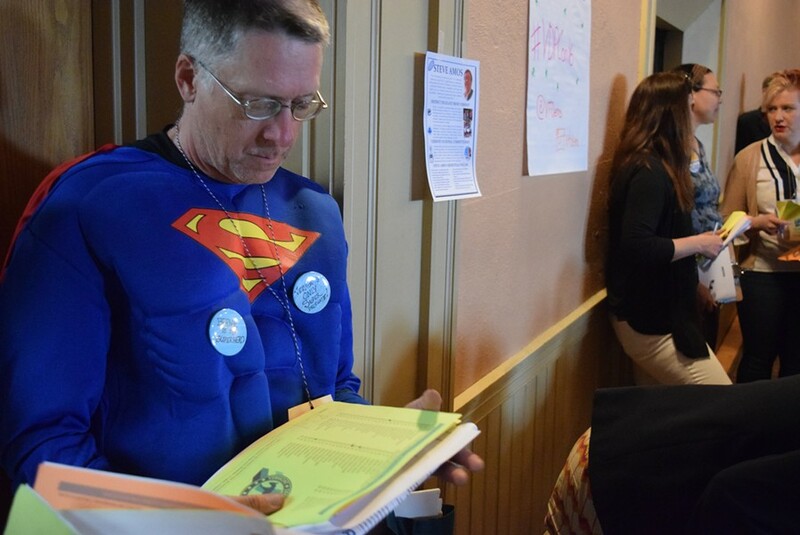 Randy Leavitt of Royalton dressed as Superman to protest superdelegates. All those Sanders supporters weren’t about to leave the convention without expressing their discontent with the Democratic Party’s superdelegate system, which allows party leaders to vote for whomever they choose at the national convention. So far, Clinton holds a significant lead over Sanders in support from superdelegates nationally. Randy Leavitt of Royalton arrived dressed as Superman to make a statement. “I’m Vermont’s only real superdelegate,” he said. For all the anger brewing over the issue, delegates didn’t dwell long on it. In an almost unanimous voice vote with no public debate, they passed a resolution that calls on the party to ditch the superdelegate status for the next presidential election in 2020. In the meantime, the resolution asks the state’s superdelegates to voluntarily follow the will of Vermont Democratic voters and cast their ballots at the national convention for Sanders. Four of Vermont’s 10 superdelegates — Gov. Peter Shumlin, Sen. Patrick Leahy (D-Vt.), former governor Howard Dean and Democratic national committeewoman Billi Gosh — are supporting Clinton. None of them were at Sunday’s convention. Leahy was attending the University of Vermont graduation, where a former staffer was being honored. He had his state director, John Tracy, stand in for him. Tracy took the stage not knowing how the crowd might react. As he was introduced, only a brief, barely audible boo emanated from the audience. In his speech, Tracy avoided mentioning Clinton. Instead, he played up Sanders and stuck to common enemies. “What Vermont and Bernie have put forth, Donald Trump would like to take away,” Tracy said, referring to the likely Republican nominee. Later in the day, the crowd found another way to express its frustration with Leahy and his proxy. Tracy, a popular former state legislator from Burlington, finished third among four candidates vying to replace Cassidy as the party’s national committeeman. The 11 district delegates elected Sunday are: Maria Rinaldi, Mary Sullivan, Claudia Pringles, Aster O’Leary, Laura Simon, Ashley Andreas, Brian Pine, Arshad Hasan, Noah Detzer, Kevin Christie and Matthew Birong Jr.